In this decision, the SCC expanded the scope of the “workplace” in relation to human rights. This case involved M, a Muslim Iranian descent who worked for Omega and Associates Engineering Ltd., and S, a site supervisor who worked for Clemas Contracting Ltd., the prime contractor on a road improvement project. While on site, S frequently taunted M based on his religion and place of origin as well as his sexual orientation. M complained to Clemas and S was eventually removed from the worksite and terminated. M then filed a complaint with the BC Human Rights Tribunal against S and Clemas (the “Respondents”) alleging discrimination. The Respondents argued that the Tribunal did not have jurisdiction to hear the matter as there was no employment relationship between M and the Respondents. The Tribunal proceeded on the basis that any discrimination suffered “regarding employment” could attract the protection of the BC Human Rights Code. The Supreme Court of Canada agreed and held that discrimination regarding employment can be perpetrated by someone other than the complainant’s employer or superior in the workplace and that the protection of the Code extends to all employee who suffer discrimination with a sufficient connection to their employment context. 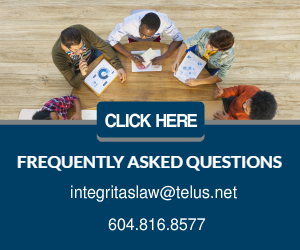 In this case, the BC Supreme Court confirmed that the test for dismissing a probationary employee is suitability. Mr. Ly was hired as the Manager of Patient Safety and Client Experience at Interior Health. His contract had a probationary clause of six months, but he was terminated after two months. During the two months, Mr. Ly repeatedly sought feedback on his performance but did not receive any. When he was terminated, he filed a wrongful dismissal action. The court held that Mr. Ly had been wrongfully terminated because Interior Health had not met its legal obligation to carry out a good faith assessment of Mr. Ly’s suitability for the position. Accordingly, Mr. Ly was awarded three months notice. The court stated that an employer can consider not only job skills, but also character, judgment, compatibility and reliability when it is assessing an employee’s suitability. This case confirms that an employee who is terminated before starting work, would be entitled to reasonable notice or damages in lieu, absent an express contractual provision to the contrary. The Plaintiff in this case executed a formal contract for the position of Senior Software Engineer at a salary of $125,000. The contract had a three-month probationary clause which permitted the employer to terminate the Plaintiff’s employment without notice. Three days before he was due to start work, the company informed the Plaintiff that it needed to retract his employment for business reasons. The Company offered the Plaintiff temporary work, which the Plaintiff did not accept as the terms were unclear. The Plaintiff then sued the company for wrongful dismissal. At trial, the company argued that the probationary clause should apply, because otherwise, the Plaintiff would enjoy better rights before he started work. The court rejected this argument on three grounds: (a) the probationary clause was not in effect on the date of the retraction; (b) a probationary clause does not give an employer an unfettered right to terminate an employee without notice, or cause; and (c) by retracting the offer, the employer repudiated the contract. The court then awarded the Plaintiff six weeks notice. This case clarifies that an employee may proceed with a complaint despite signing a settlement agreement, in certain situations. The complainant in this case was a 24-year-old single mother with a grade 11 education who worked for the Company, washing RVs. The Owner, was the President of the Company. A few weeks after the employee started work, the Owner touched her inappropriately and made sexually suggestive remarks. The employee filed a human rights complaint, but eventually agreed to settle the matter for $800 and a promise that she would be allowed to return to work. The parties then met at the bank at the Owner’s request and, while there, signed a settlement agreement. The agreement was silent on a return to work and when the complainant attempted to do so, she was rebuffed. The complainant then informed the Tribunal that she wanted to proceed with the complaint and the Company applied to dismiss the complaint based on the signed settlement agreement. While recognizing that there are strong policy reasons for holding people to settlement agreements, the Tribunal held that based on all of the circumstances, the purposes of the Human Rights Code would be best served by allowing the complaint to proceed.